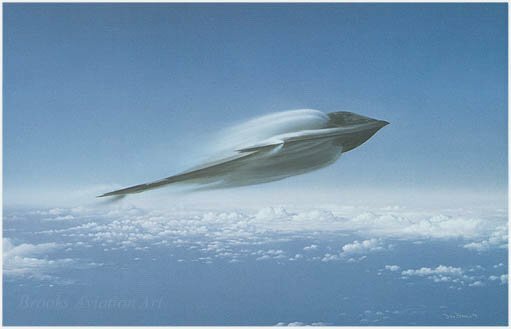 Resembling a bird of prey, our most advanced aircraft, the Stealth Bomber or “Spirit,” displays its profile as it streams vapor from its fuselage and wings. The B-2’s recently played an important role by flying 44-hour missions from Whiteman to Afghanistan and then to a recovery base in the Indian Ocean - the longest missions in history. Reproduced in exacting detail on 100lb Museum Quality Archival stock, each lithograph is individually signed by the artist, Dru Blair. "Spirit of America" is limited to 950 Signed and Numbered high quality Lithographs. Reproduced on 100 lb. Archival Stock. Each print is signed, numbered and inspected by the artist to ensure quality and color consistency. Supply is strictly limited to availability. Price $125 USD. "Spirit of America" is also available as a Giclée (pronounced "zhee-clay'), which refers to a 7-color print which utilizes the latest in digital technology to reproduce art with breathtaking accuracy. This is the largest and most expensive version of our print line, usually measuring an overall 42" inches wide, and printed on museum quality Hahnemuhle paper for $495.